Minimarket based on known products and a line of local organic products which come from less than 0 km. Wine, olive oil, fruit, vegetables, meats and cheeses. We serve breakfast, a cold lunch and aperitif in the garden outside with a fantastic panoramic view on the Chianti countryside. From Saturday 01 December to Saturday 27 April the AperiTeatro will be back!! Great collaboration with Teatro Regina Margherita Marcialla! 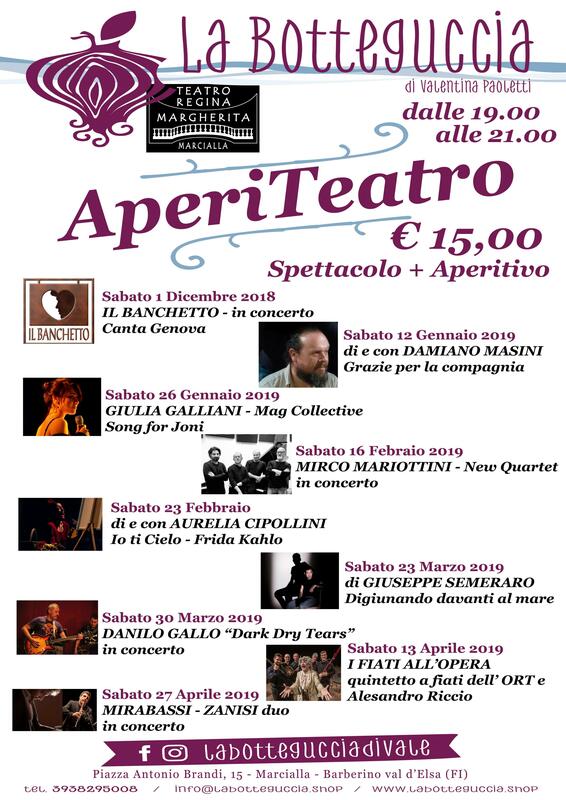 Book as always your ticket in the presale points of the Theater and from 19.30 you can have an aperitif in Botteguccia for only € 15.00 all inclusive!